Jeff's Family Adventure Files: How's Your Parent / Son / Daughter Time Going? How's Your Parent / Son / Daughter Time Going? Saturday morning we had a family foursome of disc golf. It is kind of a big deal when all of us find something we all like to do together. 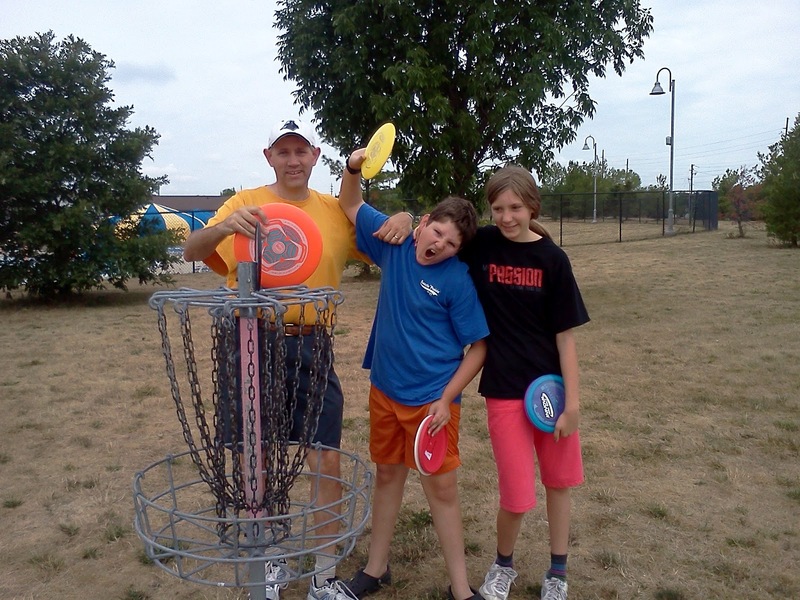 In one way, it is not necessarily about disc golf. Do you know how hard it is to get a 46 year old, 14 year old, 13 (almost) year old, and 10 year old to agree on anything other than pizza? Silly question, I'm sure you do. Not only that, but outdoor time has been harder to come by. The extreme heat and drought has affected us. Note the lack of green grass in the photo. You could say that finding common interests is like finding water (you would say gold, but water is more valuable right now). These opportunities cannot get away! On the other hand, it is about disc golf. 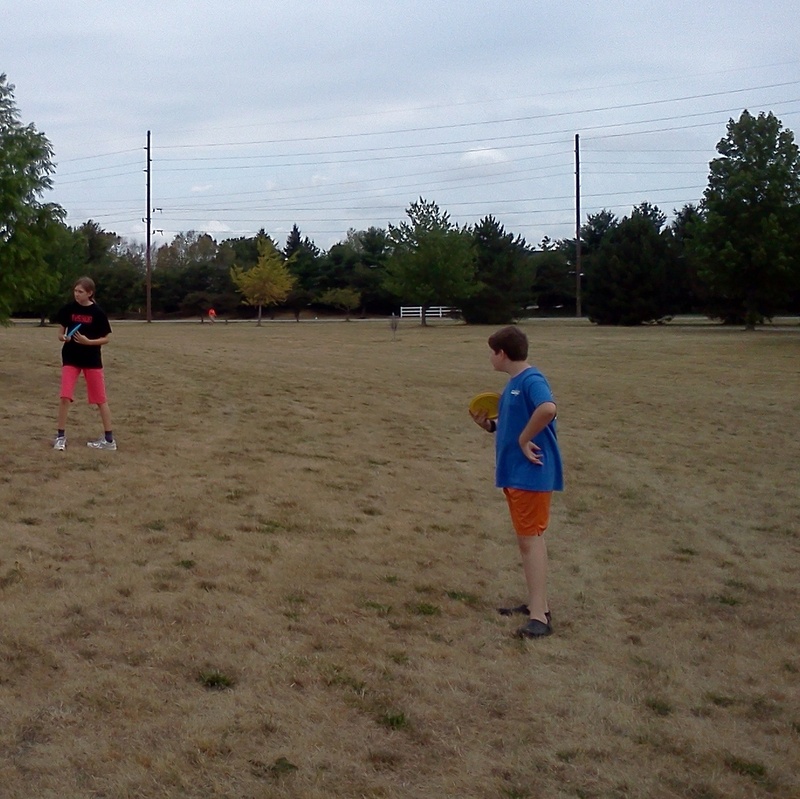 Disc golf is fun! I learned about it in college thanks to some friends taught me how to use the campus as a course. "Holes" included this tree, that lamp post, underneath that bench, but only from this direction... - Disc golf is also a teaching opportunity: strategy, friendly competition (with yourself as well as others), conversation, the thrill of victory, the agony of defeat, a good walk (spoiled), and more. Disc golf, unlike regular golf, is free (after buying special discs, which generally range from 10 to 15 dollars each). to 15 dollars each. Amazon.com has them! After we finished our round, we all agreed that we had a good morning and that we should do it again. Music to my ears! Gatorade for everybody! Action idea: What can you plan for your family that can be fun, family building, and that everyone can participate in? When can you do it? Leave some ideas in the comments, yours may inspire others! So many ideas -- home repairs, build a fort, learn a new hobby, teach a skill (we do computers, electrical outlet installations, painting a room), spring cleaning. cooking dinner (making pizzas is a blast), lawn and garden work, Art Museum (IMA is free), Crown Hill (try to find famous people's graves is a challenge and also free), go siteseeing downtown, shoveling snow, sledding, shopping at your favorite electronics store (we prefer Fry's), play video games together (we have several favorites). Need i go on? We hope to go to the State Fair together -- go on days that are free (newspaper has free admission tickets that you can pick up). Boy Scouts is a great place to start on some ideas -- the merit badges they list are an inspiration to help to get kids learning new skills and hobbies. We love family time and homeschooling makes it easy to turn those things into lifelong learning and skills that kids otherwise might not learn. Absolutely! Family time and homeschooling is so much more than academics, even more than right and wrong. All the detail you mentioned counts, too!